If you're about to begin your Red Dead Redemption 2 journey but haven't played the original instalment, you'd be forgiven for worrying about missing out on the Red Dead Redemption story so far and getting confused when you take on Arthur Morgan's massive adventure. Don't fear, as although there's plenty of information to process, we've gathered everything you need to know from the first Red Dead Redemption story right here. As Red Dead Redemption 2 is chronologically a prequel, it does means that you won't have actually missed anything story-wise if you go straight into the 2018 hit without experiencing the almost decade-old game. Still, if you want to get clued up and find out more about the immersive Western world you're about to inhabit, then get yourself comfortable and have a read through our complete recap of the Red Dead Redemption story. 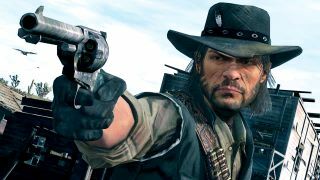 Set in 1911, Rockstar’s frontier epic centres around John Marston: a former outlaw who’s trying to go on the (admittedly violent) straight and narrow. After being strong-armed by corrupt government officials, John is forced to bring in his former criminal chums dead or alive… with an emphasis on the daisy-pushing option. A fundamentally decent man, Marston has no choice but to betray his old brothers-in-arms after Edgar Ross kidnaps his wife Abigail and teenage son, Jack. The dastardly Ross is director of the fledgeling Bureau of Investigation, and sees John as the ideal man to rid the dying West of its few remaining bandits. Before stepping off the boat in New Austin, Marston spent his teens and 20s in Dutch van der Linde’s gang – a section of his life you’ll see in great detail in Red Dead Redemption 2. The son of a surly Scot who lost both eyes in a bar brawl and the prostitute he fell in love with, John was forced to fend for himself at a young age after both his parents passed while he was still a child. We first meet John in 1911, twelve years after the events of Red Dead Redemption 2, which, despite what the title suggests, is actually a prequel. The gunslinger’s main goal is simple: he must either capture or slaughter three prominent members of his old gang. First up on the kill list is Bill Williamson, a beardy, not terribly bright scoundrel. Next, there’s Javier Escuella, a scheming low-life who hightails it to Mexico upon hearing the government are after him. Finally, there’s Dutch van der Linde; John’s former boss, and a charming sociopath who ran his gang like a Wild West Robin Hood. Though Dutch and Bill’s screen time in Red Dead Redemption is low, the upcoming prequel will see you living day in and day out with the pair as you step into the spurs of Arthur Morgan, Dutch’s loyal second-in-command. Though John has no love for the government, the outlaw has little affection for his old gang members, either. After all, they left him for dead during a failed bank robbery in 1906. And as Red Dead Redemption 2 will no doubt show us, they’re also responsible for the funky scar plastered across Marston’s grizzled mug. John’s outlaw-assaulting quest doesn’t exactly enjoy the smoothest of starts. After tracking Williamson down to his temporary home at the heavily armed Fort Mercer, our cowboy chum is promptly shot in the stomach. Luckily for our boy and his bullet-ridden colon, he’s promptly picked up on the side of the road by one Bonnie McFarlane. Fierce, principled, and progressive, this ranch owner tends to John’s injuries and gives him a place to stay on her farm while he’s healing up. In return, Marston helps her patrol the ranch, which involves shooting coyotes and crop-stealing bunnies. Once he’s properly back on his feet, John travels across New Austin to the nearby town of Armadillo, where he quickly befriends the local sheriff. As he helps Marshal Johnson and his deputies wipe out criminals, John’s pistol-twirling pursuits lead him to cross paths will all manner of colourful characters. "A scheming potion peddler, a chronic drunk, and a Wild West take on Gollum may not exactly be the A-Team, but they're able to storm Fort Mercer"
Among these strange allies is Nigel West Dickens: a crooked snake oil salesman who loves to peddle ‘miracle’ cures to anyone gullible enough to part with their dollars. Marston also makes friends with Seth (the aforementioned corpse lover) and Irish: a drunkard who harbours a legendary love of whisky and nonsense tails. After running various errands for these Western chancers, John eventually assembles a squad to attack Fort Mercer in the hopes of catching Bill Williamson. While a scheming potion peddler, a chronic drunk, and a Wild West take on Gollum may not exactly be the A-Team, between them Marston and his unlikely friends are able to storm the fort. Unfortunately for Marston, Bill has already fled before John can go postal with a mounted machine gun. Soon after, John picks up a tip that Williamson and Javier Escuella are hiding in Mexico. Cue the world’s most homicidal raft journey, as John and Irish brave choppy waters and hails of gunfire before they dock on Mexican soil. Shortly after crossing the border, Redemption serves up arguably its most memorable scene: a haunting musical moment that whispers on the breeze as Marston gallops across the prairies of Mexico for the first time. José González’s ethereal Far Away is the perfect tune for the moment, brilliantly setting the scene of a stranger out of his depth in a foreign land. During his Mexican travels, John helps turn the tides of a civil war, teams up with an ageing, legendary gunslinger, and even finds time to fleece a train. After helping to overthrow a corrupt regime, Marston tracks down Escuella, whereby you’re free to either capture or kill the conniving hombre. With the help of revolutionary Abraham Reyes, John also finally finds Williamson, and promptly puts a bullet in his former gang pal. With two of his targets either in jail or sleeping with the frontier fishies, Marston returns to America. In the final Great Plains area, John is given a taste of modern life, as the cobbled streets of Blackwater chip away at the Old West’s decaying deserts. Nevermore out of his depth, Marston soon befriends an eccentric professor, who is only too happy to lead John to Dutch… providing you save his bacon during a rooftop sniper shootout. His outlaw-ending journey almost complete, John and his government harassers track down van der Linde at the outlaw’s base among the towering pines of Tall Trees forest. After Marston mows down his men, he finally comes face to face with his former leader, yet he never gets the chance to pull the trigger. Not only is Dutch a gun-toting romantic, he’s also a martyr, as he proves when he flings himself off a cliff before Marston can bring him in. Ouch. With Dutch dead, Edgar Ross finally releases John from his service, and the cowboy promptly returns to his family back at their ranch in Beecher’s Hope. After reuniting with his wife, son, and the crotchety Uncle – who may or may not actually be his uncle – John settles down to a life of peaceful ranching. Shooting bands of outlaws is replaced with gentle herding, quality time with Jack, and leisurely rides to MacFarlane Ranch, where John is briefly reunited with Bonnie – the pair agreeing to trade with each other. As closing video games acts go, it’s downright serene. Reneging on their previous deal to let Marston live out his days in peace, Edgar and his agents storm Beecher’s Hope, and during a violent assault, kill Uncle. Thanks to his sharpshooting skills, John takes out many of Ross’ cronies, and he’s able to stall the agents long enough for Abigail and Jack to escape on horseback. Sadly though, Marston can’t escape his own past. With his wife and son safe, John confronts the government agents in a defiant last stand. Cue possibly the saddest video game ending ever. Hopelessly outgunned, Marston is swiftly put down, as Ross’ men riddle him with lead. If you don’t shed a tear during John’s tortuously prolonged death scene, you’re officially history’s greatest monster. Abigail and Jack return to discover Marston’s bloody corpse, and the game is seemingly headed for the end credits as mother and son tearfully bury John during a quietly touching funeral. Of course, that’s not the end at all. With John in the ground, the game jumps ahead four years in the blink of an outlaw eye, just as a now adult Jack buries his mother alongside Marston’s grave. Now in control of John’s fully grown son, you’re initially at a loss as to what to do. The main character is dead, the story seemingly over, and yet those credits still haven’t rolled. It’s only when you bring the map up, and see a vague stranger mission symbol off in the distance that you realise this Western epic has one final story to tell. Jack soon rides to Blackwater, following a breadcrumb trail that eventually leads the vengeful son to one Edgar Ross. After visiting his wife and brother, Jack tracks Ross down to the banks of a Mexican river; the former agent enjoying his retirement with a spot of duck hunting. Confronted by the offspring of the man he betrayed, Ross is unapologetic, blaming John’s lifestyle for his demise, not that pesky barrage of government bullets. Undeterred by Edgar’s threats, Jack enters into a duel with the man who killed his father, and seconds later, one very dead Ross floats down the river, as the mallards he was trying to murder quack in the skies above. Jack mournfully looks at his revolver, holsters the gun, then walks into the sunset, seemingly committed to the sort of lawless life his father never wanted for him. Up pop a set of amazing credits – helped no end by Ashtar Command’s haunting ‘Dead Man’s Gun’ - and the curtain closes on not only the finest cowboy game ever made, but one of the very best open-world titles there’s ever been. So that’s you all caught up on the events of John Marston’s wonderful Western. You’re now 100% ready to commit 70+ hours of your life to Red Dead Redemption 2, with the prequel whisking you back to the glory days of Dutch’s gang, as you take the role of Arthur Morgan. How much will a younger, fresh-faced Marston feature? Will the Wild West follow-up make van der Linde sympathetic? And most importantly, just how did John get that fetching scar? Buckle up, partners. The tale of Morgan and chums looks set to be the best in the West.